In response to issues of hunger, malnutrition, and unequal access to means of production that existed in Cuba leading up to the Revolution, the revolutionary government deemed food security a top priority, and conceptualized access to food as a right of all Cuban citizens. Today, food is a complex issue in Cuba: hunger has essentially been eradicated, but work is still underway to improve quality of diets, ease of accessibility, and food production. As a result, the agricultural system is and has been a major area of interest and concern for the Cuban government. Improving production is viewed as essential both to support domestic consumption and to increase exports. Today, agriculture is Cuba’s largest sector, employing 18 percent of working Cubans. While sugarcane remains the primary crop, and agricultural chemicals are still distributed to cooperatives, an “agroecological” sector of small farms is thriving and has become well-known around the world. In 1961, the Cuban government formed a state company, Acopio, to oversee food procurement and distribution. Every year, the government creates a centralized plan to outline production goals for the year, and each cooperative and state farm create a plan to meet their quota of production, which they sell directly to Acopio. The state organizes the distribution of this food, in combination with imported goods, to citizens and institutions. The ration system, first implemented in 1962 and still in effect today, guarantees a minimum level of basic goods (such as rice, cooking oil, bread, and sugar) for each household or individual to pick up at local bodegas and placitas. Food not designated for rations can be sold at the placitas, state-run markets, or distributed to other institutions. After meeting their quotas, farmers sell surplus at private farmers’ markets (with regulated prices), to third-party vendors who sell it from street carts, or directly to consumers. It is difficult to collect data on the percentage of food that Cuban citizens receive from the ration versus these other sources, but significant supplementation is needed to fulfill all caloric requirements and diversify the diet. Most Cubans attend farmers’ markets, buy food from vendors selling vegetables in the street, visit “La Shopping,” stores to purchase imported foods in convertible currency and/or participate in the gray market. In recent years, rising prices have been an issue as the economy has shifted, and climatic variability and storms have also created periodic scarcity. Cuba’s principal crop and most valuable export is sugarcane: raw sugar is its first export, distilled alcohol — made from sugar — its third, and refined sugar its fourth. Tobacco products, honey, coffee, and, to a lesser extent, juice concentrate round out its list of top ten most valuable export products. After sugar, Cuba’s agricultural acreage is largely dedicated to food production plus tobacco: root crops, bananas, vegetables, cereals, and legumes, tobacco, and other fruits (in that order). In recent years, China, Belarus and Portugal have been Cuba’s most valuable sugar markets, and Germany is a rising market for honey and green coffee. 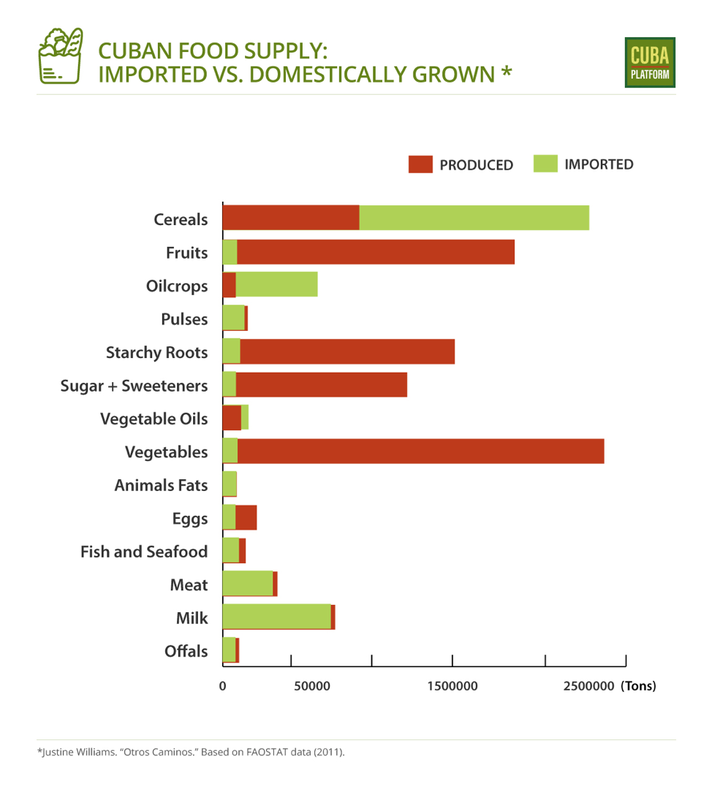 Significant controversy exists surrounding Cuba’s dependency on imports to feed the population. Commentators and reporters often remark that approximately 80 percent of Cuba’s food is imported. However, this statistic can be traced back to analysis of the ration package, which is composed of foods for which the country is particularly dependent (wheat for bread, oil for cooking, and, to a lesser but significant extent, rice). Analysis of FAO statistics indicates that, in reality, the country vacillates between 30–40 percent import dependency (excluding sugar), due to the country’s self-reliance in terms of vegetable, root crop, fruit, and egg production.Significant sources of imported food include Vietnam (rice), Brazil (rice, soybean oil, and chicken), Argentina (rice), Canada and France (wheat), Russia (soybean oil) and the United States (soybean oil and chicken). In the 1990s, the sudden drop in food, fuel, and agricultural imports opened the door to a new paradigm of agriculture in Cuba. During this period, it was necessary for both citizens and the government to innovate in order to sustain themselves, and supporters of organic agriculture ushered in a host of new research institutions, infrastructure, and policies in support of this form of agriculture. As described in the article brief on “Land Reform,” this period was marked by decentralization of agriculture and a focus on producing in more localized spaces. Many farmers combined traditional knowledge with new scientific research on agroecology to grow diversified crops of fruits and vegetables. Methods for farming with animal traction (instead of tractors) were restored, along with new methods for composting, worm composting, and biological pest management, and networks were developed among farmers for sharing this information. Famously, urban agriculture gained popularity during this time. In response to grassroots efforts to grow wherever possible, the state created a department of agriculture and set up urban farms in every municipality, along with infrastructure for providing resources, marketing, and training to these farms. In 2017, the urban agriculture sector produced 1.27 tons of vegetables, fruits, and herbs, all for distribution through hospitals, institutions, and local residents, and all produced without chemicals. These advances have become recognized around the world as proof that food can be produced at high levels, with few resources, and without degrading local environments. However, despite the image of Cuba as a haven for organic agriculture, the country remains split as to whether to pursue this type of farming in full, or to reinvest in industrial production. Significant acreage is still dedicated to monocrops, and the state distributes agricultural chemicals to farms when it has the capacity to purchase them. Because there is no specifically organic market, food that is grown without chemicals is mixed into the same distribution chain, and statistics are not collected on organic versus non-organic production. Cuba has achieved considerable success in greatly reducing hunger and malnutrition through a variety of strategies including rations, regulated pricing, and free meals at schools, hospitals, and other institutions. Nonetheless, obesity, diabetes and other dietary related diseases are common, and some Cubans report concern with the lack of variability, ease of access, and healthfulness of food options. The typical Cuban diet is high in starch, oil, and sugar. Although the country has become a pioneer in agroecological production, scaling up output remains challenging as many young people are leaving the countryside and agricultural work. Additionally, the general lack of resources (accentuated by the U.S. embargo against Cuba) hampers rural and farming infrastructure and contributes to distribution challenges and food waste. As Cuba struggles to attain not only food security, but also food sovereignty–the ability of a country and its people to exercise control and choice over their food–it faces questions as to what paradigm of production it will embrace.